A Shot At The Buzzer Caps NCAA Drama The madness marches on. Sunday holds eight more games in the NCAA Division 1 men's basketball tournament. On Saturday, thankfully, there were no major rip-up-your-bracket upsets, but there was plenty of drama. 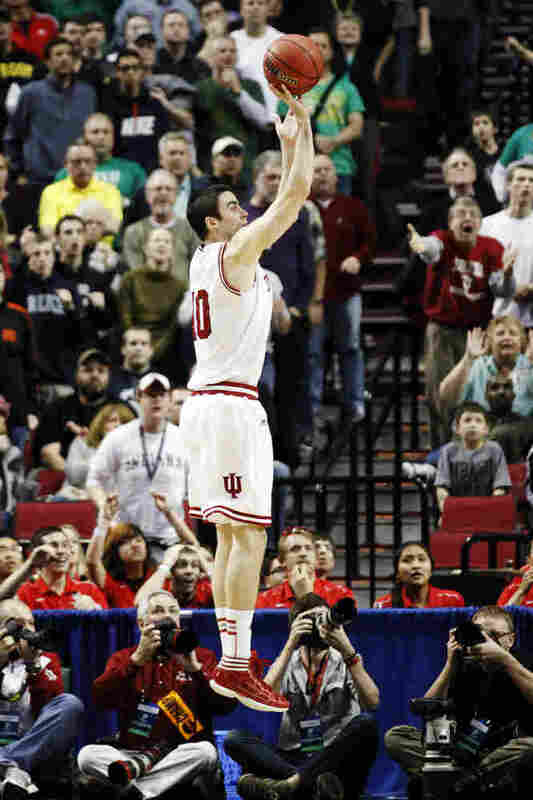 Indiana forward Will Sheehey takes the game-winning shot against Virginia Commonwealth in the second half of an NCAA college basketball tournament third-round game in Portland, Ore., on Saturday. Indiana won 63-61. The madness marches on. Sunday holds eight more games in the NCAA Division 1 men's basketball tournament. On Saturday, thankfully, there were no major rip-up-your-bracket upsets. That is, if your bracket was in still in one piece. But there was plenty of drama. Two of the most exciting games were at the sub-regional in Portland, Ore.
March Madness isn't just screaming crowds and grown men and women chanting things like the University of New Mexico's "Everyone's a Lobo, woof, woof, woof." In fact, sometimes there's drama in hushed silence. That was the sound last night as New Mexico star forward Drew Gordon lay on the court grimacing, clutching his left knee. His head coach, Steve Alford, bent over him and told him to breathe. It was only the first half in the game against Louisville, but it suddenly looked bad – for Gordon, a senior, and for the Lobos. But these are young and elastic athletes. When the New Mexico pep band serenaded the team as it ran off the court at halftime, Gordon was running with them, his knee taped. His return was critical – late in the game, he was in the middle of a fierce rally from 15 points down. The Lobos got within two points, but couldn't get over the hump. In the Louisville locker room, a bunch of happy, heavily tattooed players talked excitedly about heading to the next round – and the importance of not blowing 15-point, second-half leads. "We got a little too happy, a little ahead of ourselves," senior guard Chris Smith said. "Thought the game was over, you know, but it wasn't over. A lead is fool's gold in the NCAA." The Virginia Commonwealth Rams were mining that same fool's gold in the opening game last night. A quick refresher: The Rams were last year's tournament "David" – a low-seeded, mid-major school that toppled Goliath after Goliath on its way to the Final Four. In this tournament, the 12th-seeded VCU opened a 9-point, second-half lead over fourth-seeded Indiana. But then the shots stopped falling and Indiana surged. With the score tied at 61, Hoosier guard Victor Oladipo put his head down and drove hard to the hoop. When his attempt was blocked, he shot the ball instead to Will Sheehy, whose baseline jumper won the game, 63-61. A dramatic moment, but it may be forgotten as soon as Sunday, replaced by other moments. Such is the nature of the madness, but for the principals, those moments will endure. "Our team was really just making a push, and that was pretty much icing on the cake," Sheehy said. "This really stings," said VCU's Rob Brandenberg, whose 3-point shot for a win at the buzzer rimmed out. And VCU Head Coach Shaka Smart opened his postgame press conference with a big sigh. "As far as how long it'll take me? Forever," he said. "I don't get over games like this. I didn't get over the Butler game last year. Just gotta move on, though. What's done is done." But Indiana and Louisville are departing Portland happy, setting a course for the sweet 16.